France My Way, Adventures of a Solo Traveler is the result of nine visits to France from my first experience way back in 1971 to the present. 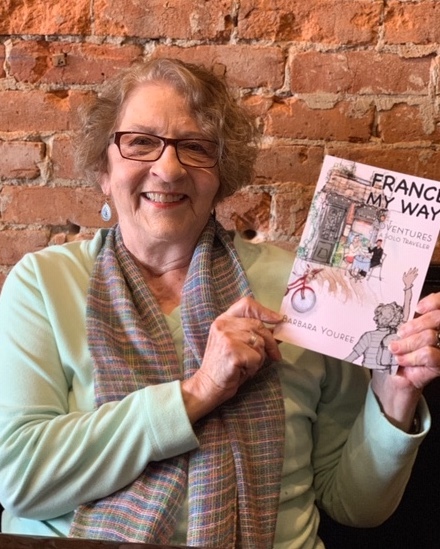 The stories I tell in the memoir include many challenges and scary situations, but also plenty of humorous incidents, amazing surprises, and the fabulous hospitality I experienced from the French people. 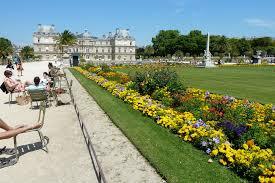 In choosing which events to include, I’ve kept in mind readers who will identify with my solo travel even if France has not been their destination, those who are weary of planned tours, and those looking for places to visit in France. I hope to entertain some armchair travelers as well. Perhaps I will encourage some to strike out on their own—or not. I carefully observed others, tried to observe protocol, and kept the fork in my left hand after cutting meat. I hadn’t watched closely enough, however. I reached to pour my own wine, having noticed someone at the next table serving himself. The lady across from me immediately corrected my blunder. “Non, non, non, ma chère mademoiselle! One passes the glass to Madame Gagnier at the head of the table. She will pour for you. I jerked my hand back. Everyone at the table stopped to look at me. I had been given the place on the side of the table, right next to Madame Gagnier who sat officially—I assumed—at the end. Thus the open bottle sat directly in front of me as well has her. I’m still not sure if that is French custom or merely the tradition at Madame Beauvais’ pension. The courses in turn were placed on the six tables in bowls or on serving platters as the previous ones were removed. No such rule seemed to apply to these dishes. But I waited to receive the passed bowl. Following the wine incident, no one made eye contact with me for several minutes. After the heat had cooled from my face, those around me made me the central focus by asking questions: Where was I from? What did I think of their President Georges Pompidou? Did I think Robin Williams was outrageous? Were American teenagers as wild as those in France? Of course, each person joined in with his or her own opinion. That included both favorable and unfavorable remarks about the United States. I smiled and did as I was told. The lady added, “Remember which napkin is yours. You will pick it up from the basket and use it for the week.” I noticed the napkins were all of different patterns and colors. Later I learned we would be issued one sheet a week for the bed. The top used sheet was then to be put on the bottom and the fresh one would replace the top. The bottom sheet was pulled up over and around the long bolster that served as a pillow. All right, I could do this. Author sudanfacesPosted on April 14, 2019 April 22, 2019 Categories UncategorizedLeave a comment on MY BOOK IS OUT! 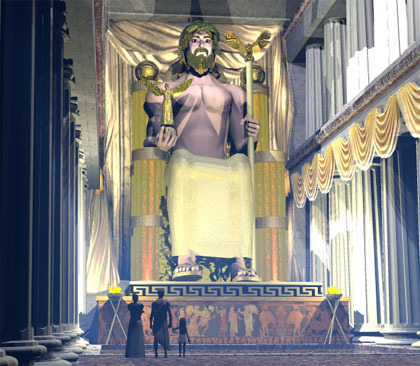 Author sudanfacesPosted on May 28, 2012 May 29, 2012 Categories RACE TO GLORY - FUN FACTSTags Statue of Zeus, Temple of Zeus3 Comments on What if Zeus stood up? Chapter 1 – page 1: The young man curled his toes into the marble grooves of the starting slab. He tensed his naked body into the required standing position. Glistening with olive oil and sprinkled with fine sand, he waited . . .
A marble slab with two side-by-side deep grooves about seven inches apart, formed the starting line for all footraces in ancient Greek stadiums. The runners lined up, about 20 at a time. At the signal from a judge, they curled their toes into the grooves, one foot forward, the other back. Rather than crouching as in modern races, the contestants stood and leaned slightly forward with their arms outstretched. A rope stretched chest high across the runners, held by a spring-loaded mechanism at each end to form the starting gate. An official released the taut rope with a trigger that banged it to the ground as another official called out the word ápete! The runners then sprang forward to race to the finish. Barbara Youree Create a free website or blog at WordPress.com.